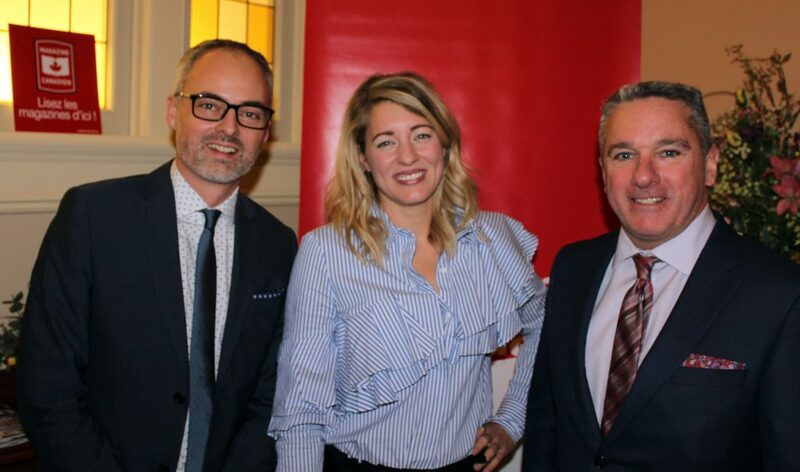 In her speech, Minister Joly recognized Magazines Canada as an important partner in the #CreativeCanada strategy, particularly on efforts to modernize the Canada Periodical Fund, which the Government has confirmed as the primary vehicle for supporting Canadian magazines and paid community newspapers in Canada. 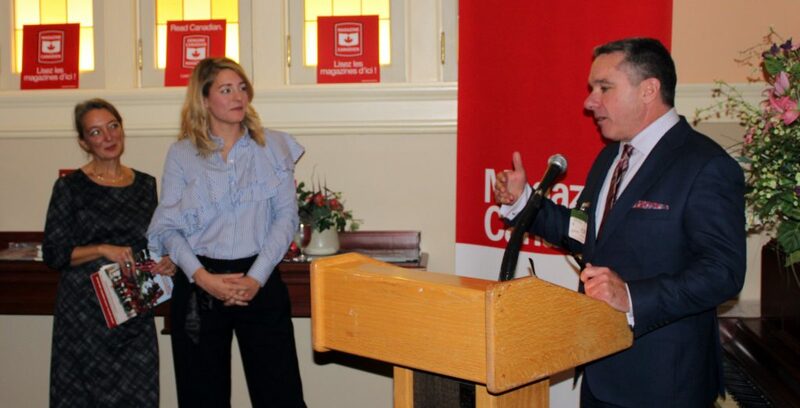 Minister Joly also underscored the Government’s ongoing commitment to promote and protect Canadian culture and the culture industries. 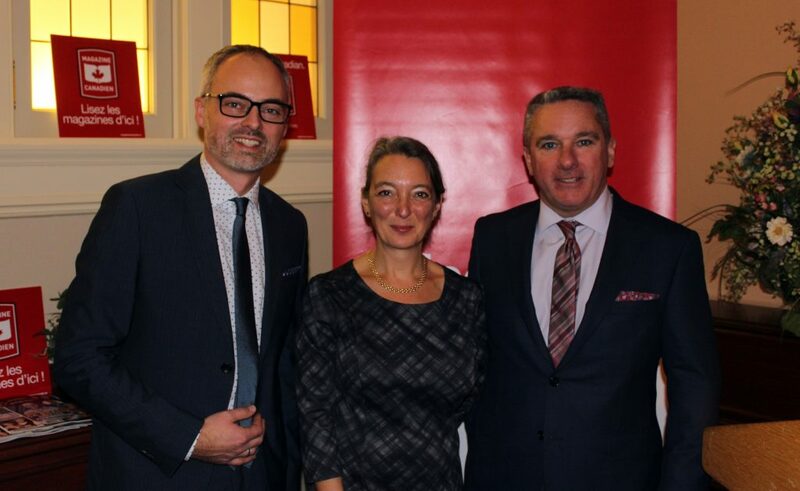 It was a high-energy evening, with senior leaders from across the Canadian magazine media sector gathering with Members of Parliament, Senators and other influential Ottawa decision-makers who are responsible for Canada’s cultural policy and programs. Magazines Canada members publish Canadian-owned, Canadian-content consumer, cultural, specialty, professional and business media magazines in French and English, made available on multiple platforms. Reception guests were invited to browse magazine newsstands set up especially for the event, where attendees could take home a favourite Canadian magazine to keep for a relaxing #MagazineMoment. Along with Magazines Canada, representatives from the Canadian Farm Press Association / Association Canadienne des publications agricoles were also in attendance to emphasize the importance of the Canada Periodical Fund to their member magazines, which reach farmers, ranchers and rural residents in regions across the country. Canadian Heritage officials are pursuing their work to review and modernize the Canada Periodical Fund while continuing to support the Canadian magazine sector, recognizing the important role Canadian magazines play, both culturally and economically. In her #CreativeCanada speech this September, the Minister identified three “pillars” for Canada’s creative industries going forward: investing in Canadian creators and cultural entrepreneurs, promoting the discovery and distribution of content at home and globally, and working to strengthen public broadcasting and support for local news and information, including the Canada Periodical Fund. Canadian magazines promote social cohesion, and are an important economic sector that contributes to Canada’s competitiveness. Canada’s nearly 2,700 business-to-business, consumer and cultural magazines contribute approximately $1.7 billion to Canada’s GDP, are produced in every province and territory across the country, and are published in 34 different languages. Magazines Canada is the national trade association representing Canadian-owned, Canadian-content consumer, cultural, specialty, professional and business media magazines. French and English member titles offer a wide range of topics including business, professional, news, politics, sports, arts and culture, leisure, lifestyle, women and youth, made available on multiple platforms. The association focuses on government affairs, services to the advertising trade, circulation marketing and the development of career skills and the recognition of excellence among the people who work in Canada’s magazine media.